The Appaloosa is an American horse breed best known for its spotted coat. History: Spanish conquistadors introduced many European horse breeds, including Andalusian horses to Mexico in the 1500s, after which they rapidly spread throughout North America. After centuries roaming in the wilderness, these animals were caught and domesticated again by America’s many native peoples. 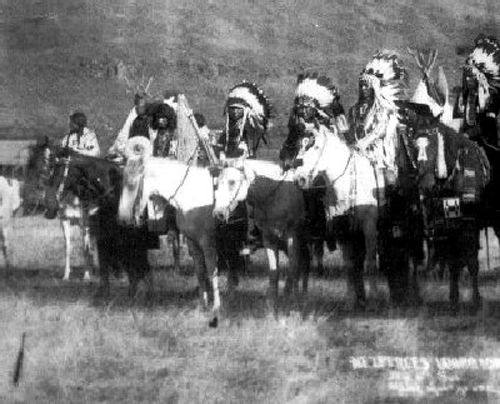 The Nez Percé tribe of the Pacific Northwest, a powerful Indian nation dwelling along the Palouse river, became excellent horsemen and careful breeders. By selecting only the best stallions for breeding, they created herds of strong, good-looking animals of which an estimated 10 per cent carried the genetic makeup resulting in various coat spotting patterns. The word Appaloosa is derived from “A Palouse Horse” referring to the origin of the breed in the Palouse area, a section of northwestern United States, encompassing southeastern Washington, north central Idaho and parts of northeast Oregon. This was the wild horses’ natural habitat (and there are still feral horses there today). The Nez Percé War against the US Army over land rights, which began in 1877, saw the tribe’s beautiful horses captured, abandoned, sold and shot. Some remained on reservations or escaped into the wild. The origin story was virtually forgotten until an article in Western Horseman magazine in 1937 renewed interest in preserving the breed and led to the formation of the Appaloosa Horse Club in 1938. Since then the appreciation for this distinct breed has only grown steadily stronger. Folk singer Fred Small’s 1983 song “The Heart of the Appaloosa” describes the events of the Nez Perce War, highlighting the Nez Perce’s skillful use of the Appaloosa breed in battle and in flight. Characteristics: The Appaloosa coat combines a base colour (bay, black, chestnut, palomino, buckskin, cremello or perlino, roan, gray, dun or grulla) with an overlaid spotting pattern (spots, blanket, leopard, snowflake, marbled, mottled or frost). The appaloosa also has visible white sclera around the eyeballs, striped hooves, and mottled skin. The Leopard Complex? 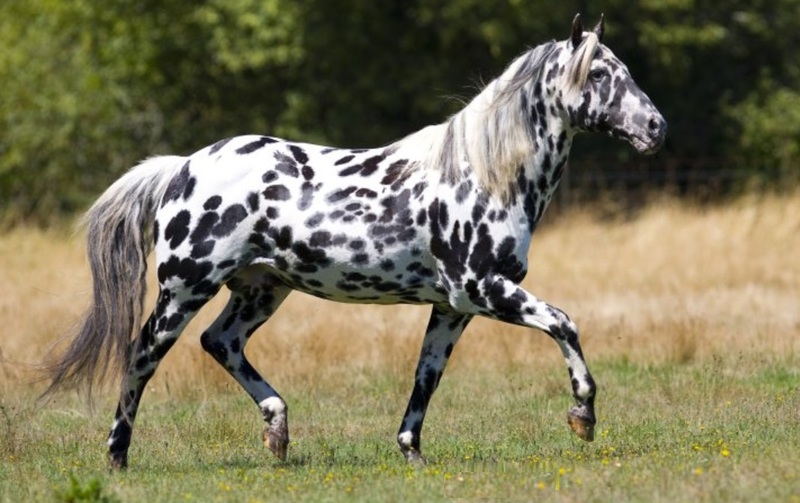 The color pattern of the Appaloosa is of interest to those who study equine coat color genetics, as it and several other physical characteristics are linked to the leopard complex mutation. This is the name given to a distinct group of genetically related coat patterns in horses. 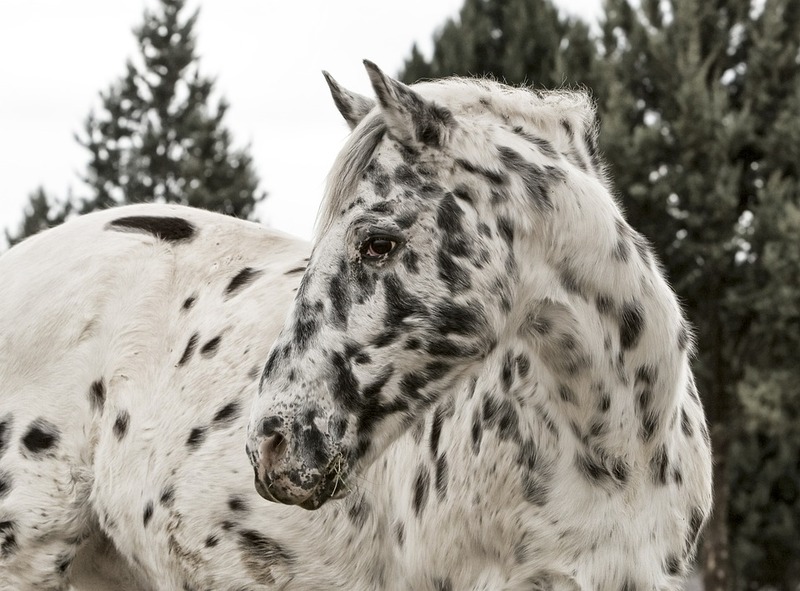 These patterns range from progressive increases in interspersed white hair similar to graying or roan to distinctive, Dalmatian-like leopard spots on a white coat. Appaloosas are prone to develop equine recurrent uveitis and congenital stationary night blindness; the latter has also been linked to the leopard complex. 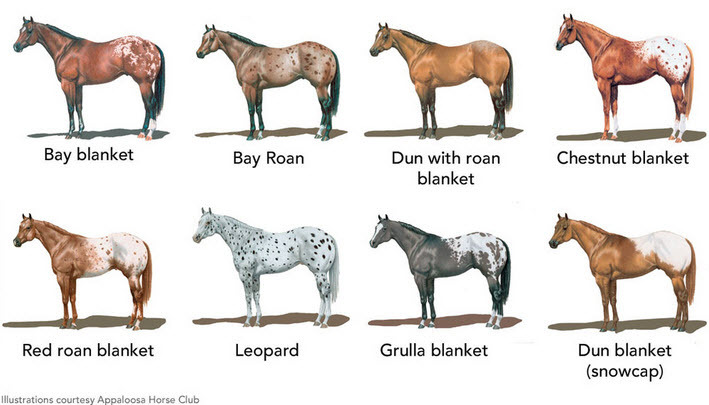 Some Appaloosas do not display the unique coat patterns; solid-coloured horses must be blood-typed to verify their Appaloosa parentage if they are going to be competed in recognized shows, raced, or bred. The Appaloosa stands between 14.2-16 hands. Body types vary depending on more modern influences such as Quarter Horse, Arabian or Thoroughbred blood, but generally they are balanced, well-muscled, and with powerful quarters, built for speed, stamina, and agility. Some sport a rather scarce mane and tail. Uses: The Appaloosa is often seen in Western events including pleasure classes, barrel racing, cutting and roping, but they can also be found in nearly every discipline – racing, dressage, jumping and endurance. They also make fun and reliable family horses.